I’ve had a really stimulating day today moderating an online community for some NPD work – with more to come this evening and the next three days on and off. The training from 20/20 in the States was really clear I think, though getting set up is never as quick as people tell you. We’ve set up a few projectives / creative elements to this – and had some amazing dividends from that already. I’m wondering though whether the excellence of the first person’s response to one projective exercise is freaking out the others … she’s the only one to post on that one. We shall see. The challenge for me is remembering who everyone is, especially as most of them haven’t uploaded profile pics yet. Juggling eight people’s perspectives in a group is one thing, but the slightly bigger numbers in a bulletin board community (we have 14) and stop-start nature of the interaction make it a different challenge. Remembering each person’s angle and narrative can require a lot of reading back. But the great thing with online communities is just that, it’s the ability to read back and cross-compare as you go. This one’s going very nicely so far: rich stuff. Hassling people to upload profile pics, I started feeling guilty: not everyone likes how they look. I certainly don’t. I wonder if I came across as some sort of body fascist or online creep by insisting on seeing my participants. But they can upload a picture of Ken Dodd for all I care, just as long as I have a visual hook to remember them by. 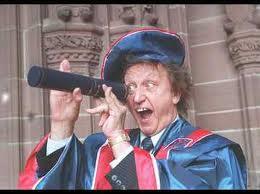 And as this picture shows, even Ken Dodd can exude gravitas and urbanity on occasion (just not this one). Of course I could just try remembering their names … don’t worry, I’m getting there. This entry was posted in Innovation, Online, Qual Research, Shore, Techniques and tagged identities, innovation, MROCs, online qual, social media. Bookmark the permalink.